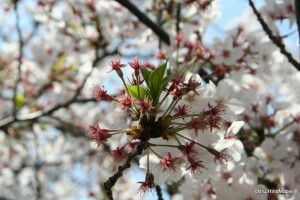 2012 is the year of rebirth in Japan. People are starting to put the events of the big earthquake behind them and the hanami parties have restarted. Last year Governor Ishihara, the top politician in Tokyo, called for restraint during the hanami season. He asked people to not have hanami parties so most of the festivities were cancelled. This year was a big change. There were no calls to stop any hanami parties and from what I saw with my friends, the parties were back with a vengeance. For a week around the peak of the hanami season, all I would hear about is hanami this, hanami that. Last year was just a few pictures but this year there were dozens of parties all over Tokyo. There are two or three major places for partying in Tokyo. 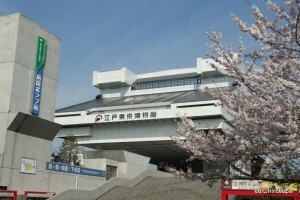 The first place is Yoyogi Park. It is a large park that I have written about in the past. It is common to see people occupy every corner of the park during the cherry blossom season. On the weekend of April 7th and 8th, it was very difficult to not see someone at Yoyogi Park. While I was working on the 7th, I knew that if I just showed up at Yoyogi Park with a pack of beer, I could walk around the park and find someone sooner or later. All I would have had to do was shout and I’m sure I would find someone. I had at least 10-20 friends that I knew of in Yoyogi Park at that time and not all of them were together. It wouldn’t be the easiest task trying to find someone but if you are patient and just walk around and around, you are bound to find someone somewhere. Ueno Park is the other major place for parties. It is one of the most popular places for Japanese people to go for hanami parties but this year didn’t seem so popular from the reports of my friends. This year I heard of more parties at Sumida Park near Asakusa Station. It is a great place as more and more people who want to take advantage of the views of Tokyo Sky Tree. I think this year is not the best time to go to a party to see Tokyo Sky Tree at night as it isn’t lit up yet, but next year will be different. While partying is an essential part of any hanami season, it isn’t the only thing people do. Walking about and enjoying the cherry blossoms themselves is essential to hanami. 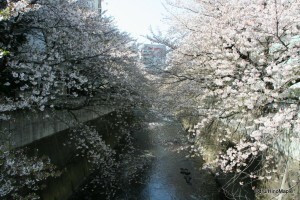 The most popular places, as I have said before, are Nakameguro and Chidorigafuchi. They are the most popular places for people to go out and see the cherry blossoms but they aren’t the most popular for parties as there isn’t as much space for people to set up an area to party. While these are the most popular places to visit, they aren’t the best places to go. There are a lot of hidden gems all over Tokyo. Recently, Kinshi Park at Kinshicho Station has been renovated leading to a lot of beautiful cherry trees with Tokyo Sky Tree in the backdrop. It is a great place to go but be aware that there are a lot of kids in the park too. Alternatively, at Sumiyoshi Station, there is a large park on the river with many beautiful cherry trees as well as great views of Tokyo Sky Tree. This year’s theme seems to be Tokyo Sky Tree but there are plenty of places around Tokyo Tower to enjoy the cherry blossoms as well. If you want something a bit more hidden, heading to Takadanobaba Station and east along the Kanda River will take you to a local favourite where the cherry trees span the river to create a beautiful canopy. Partying in the hanami season is a lot of fun but also a little dangerous. It is common to see rowdy young people doing stupid things in the parks. This is obvious due to the influence of alcohol. They are also very happy to give away alcohol which they don’t want. 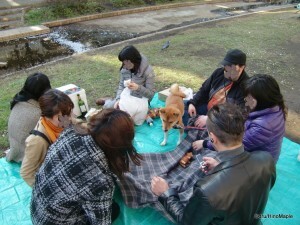 Whenever you go to any party or barbecue in the park, it is easy to find people willing to give you some food or drinks. Whatever people don’t want to take home, they’ll give it to you. When the party outside becomes too cold for people to survive, a lot of people head indoors to someone’s house or some restaurant. The party can go on forever and usually ends up with people stumbling home. It is a little dangerous this way but it is all part of the experience. Hanami season is a great time to visit Japan but do be aware that things can get rowdy wherever you are. This entry was posted in Sakura (Cherry Blossoms), Tokyo and tagged Cherry Blossom, Cherry Blossom Party, Cherry Blossom season, Chidorigafuchi, hanami, hanami party, japan, Kanda River, Kinshi Park, Kinshicho Station, Nakameguro, Sumida River, Sumiyoshi Station, Takadanobaba Station, Tokyo Sky Tree, Ueno Park, Yoyogi Park by Dru. Bookmark the permalink. Interesting what you say about Ueno Park vs Sumida River/Sky Tree. My pet theory is that you only go to Ueno Park if you really want to get very drunk. It’s so crowded, too, that I get claustrophobic just thinking about it. I actually haven’t been to Ueno for a long time. I went once and it was pretty busy in the afternoon. I have seen dozens of photos and even a TV report where a drunk guy literally fell down 5 steps head first. I try to avoid the really bad places during the hanami season.